There are 118,000 children in the U.S. foster care system currently awaiting adoption, but 15- to -18-year-olds represented only 5% of all adoptions in 2017. This campaign spotlights the need to find permanent families for teens, who have lower overall adoption rates and wait longer to be adopted than younger children. The newest PSAs highlight this need by reminding parents that there are plenty of heartwarming “firsts” to share with a teen. This messaging recruits loving families for teens by reassuring prospective parents that even if they are not “perfect,” they can provide the support and commitment that teens in foster care need and deserve. 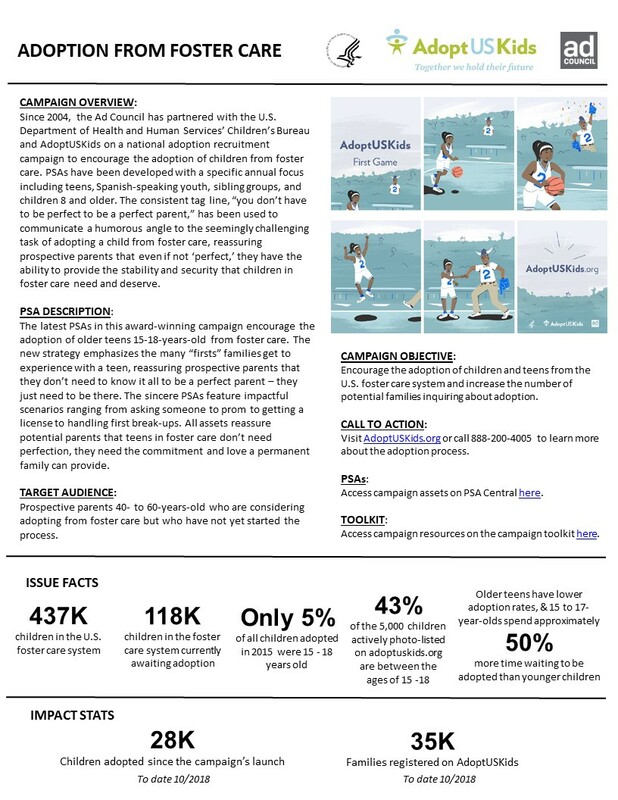 Utilize this section to reference background information, research, and other adoption resources relating to the Adoption from Foster Care public service advertising campaign. For additional resources, please visit here. 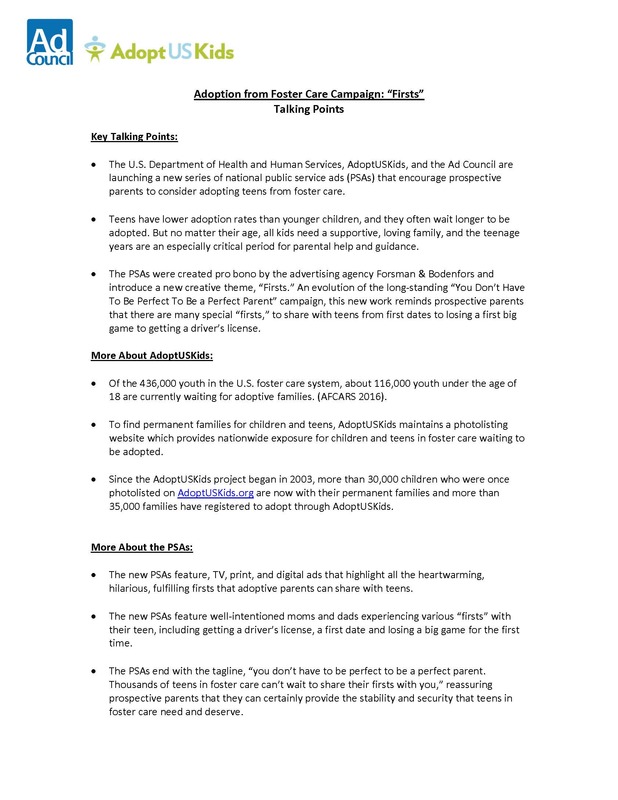 One-page fact sheet includes background information and historical context for the Adoption from Foster Care campaign. Review this document to familiarize yourself with key facts, statistics, and information about both the issue and the campaign. 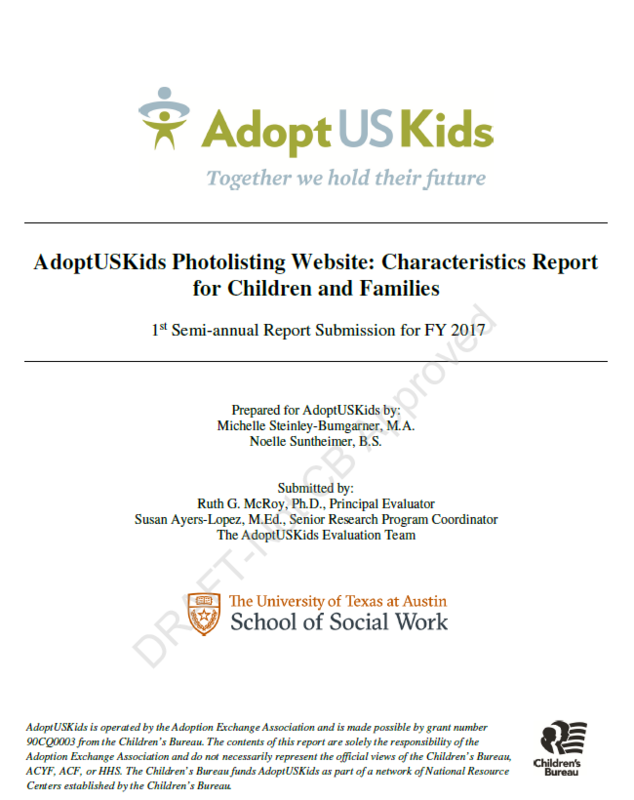 Report detailing the demographic breakdown of children and youth 11 to 17 years old photolisted on the AdoptUSKids website. 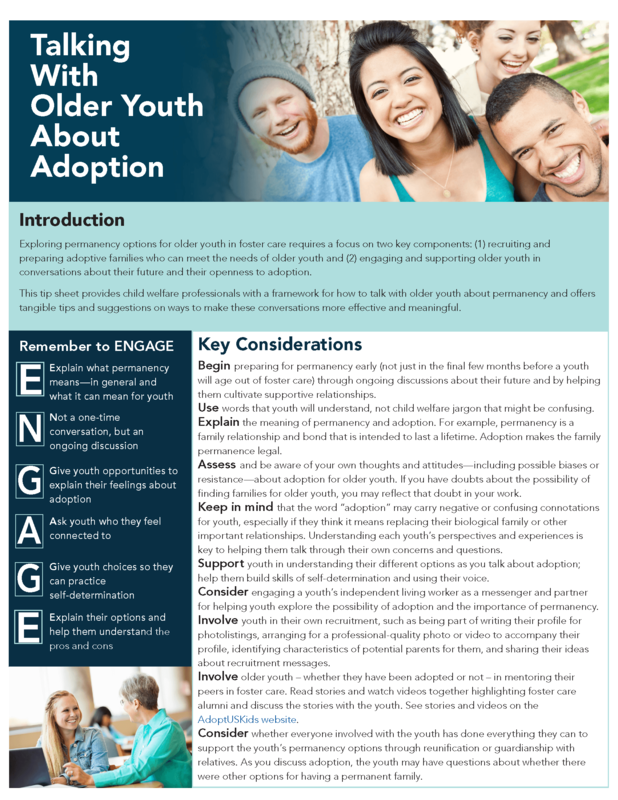 Document providing valuable tools and information to aid in the recruitment of prospective adoptive families for older sibling group youth in the foster care system. 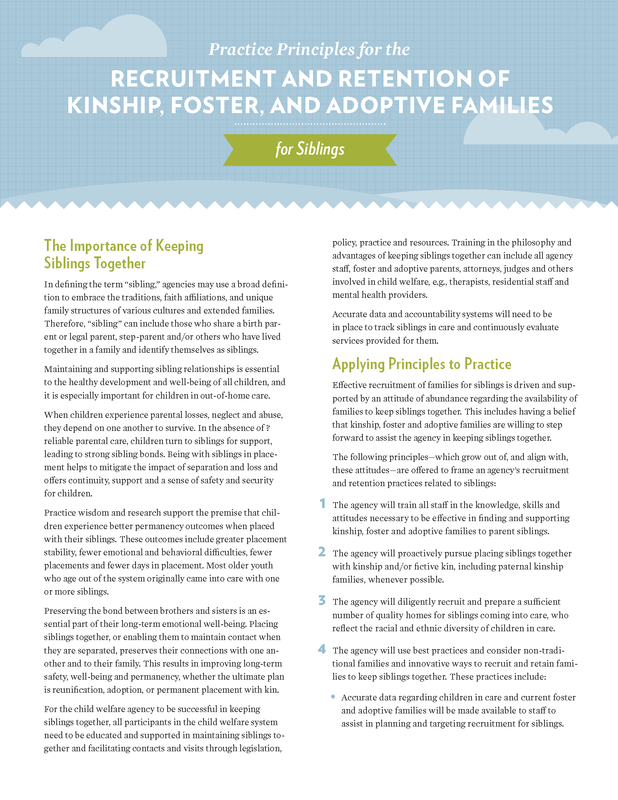 Document providing valuable tools and information to aid in the recruitment of prospective adoptive families for older siblings in the foster care system. Have a question? 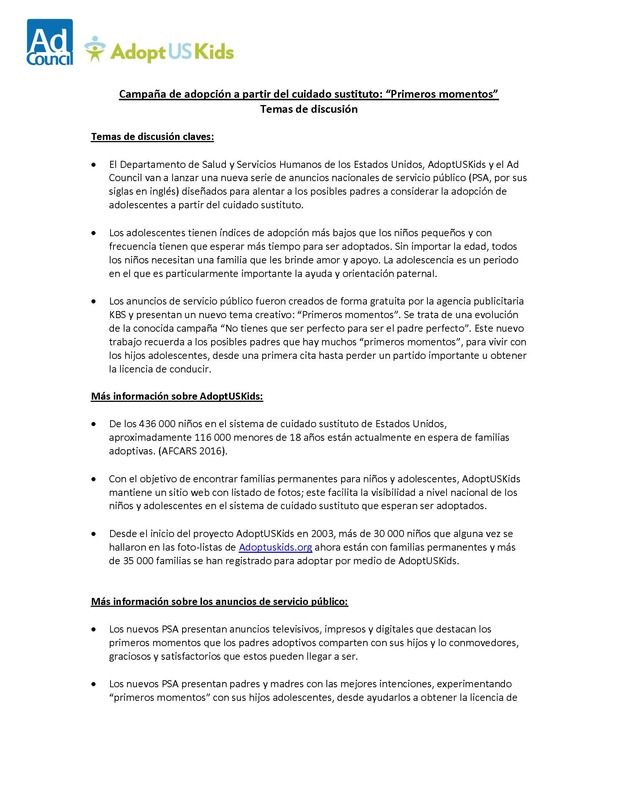 For more information email Melissa Otero, AdoptUSKids National Campaign Director, at motero@adoptuskids.org.